It's a busy month at Plain City Presbyterian Church. Please see the current newsletter for news on all monthly events. Several events are featured here. 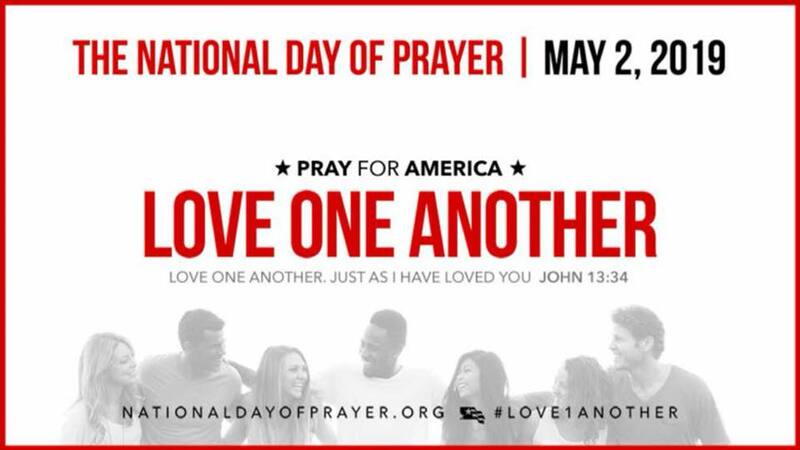 The National Day of Prayer-National Day of Prayer is Thursday, May 2. Plain City Observance will be at noon at Pastime Park. Mark your calendars and plan to join us! The Presbyterian Women's Circle will honor our two graduating seniors, Nick Bodenbender and Thomas Stapp, on Sunday May 5. Come share in a time of celebration of their accomplishments and give well wishes for their future success. LIGHT YOUTH PROGRAM: We will be kicking off on March 24 studying Easter from Peter's point of view. Grades 6 and up will be led by Whitney Reed continuing with A Biblical Worldview. 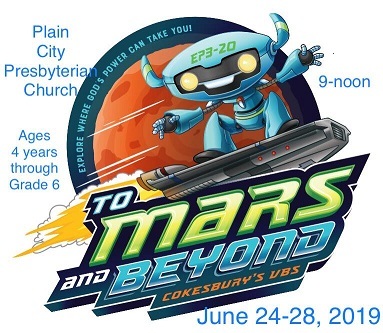 Mark your calendars now for Vacation Bible School Explore Where God's Power Can Take You with To Mars and Beyond Vacation Bible School. Galaxy voyagers journey from their galactic outpost on special missions to collect power sources. Along the way, they'll learn how God walked with heroes of the Bible, and that God is always with them, too. Everyone enjoys the amazing space theme. Our fearless leader, Rosemary Anderson, is need of volunteers so please let her know if you can help in any way. MISSION TRIP: The Mission Trip group will be leaving for Point Pleasant, WV June 16 and will return on June 23rd. We will be working to restore, upgrade or rebuild homes in a poverty-stricken area of WV. Not only will we share our carpentry skills, but we will share the love of Jesus with the people we meet. We will be joining teams from the Dublin and Marysville Presbyterian churches. Please let Jim Kaufman know as soon as possible if you desire more information and are interested in participating. BIBLE STUDY OPPORTUNITIES: Monday Night Bible Study resumed on March 4 studying Max Lucado's He Chose the Nails. This group meets for Prayer at 6:30 pm and then the Study begins at 6:45 pm. Christian Conversations meets Sunday morning at 9:15 am with Frank and Jerry Smith leading the group. Ladies' Bible Study meets Sunday mornings at 9:15 am. They will begin a 6 week session on It's Not Supposeed to be this Way by Lysa Terkeurst. GENTLE SPIRIT SUPPORT GROUP: Are you or a family member struggling emotionally with cancer and its treatments or life after treatment? Come join Gentle Spirit, a Christian emotional and spiritual support group for help during this difficult time. Reverand Alice and Beth Beach, both cancer survivors, are co-facilitating this group at the montly meeting. There will be a light supper donated by Der Dutchman, a time of sharing, fellowship, a short Biblical meditation and prayer. See the calendar or call the office for the next scheduled meeting. Enjoy a meal at Max & Erma's on the first Thursday of the month and 20% of your bill will be returned to the church for our Mission Trip Fund. Please call the church office if you need vouchers or see the current newsletter. Gather up your friends and family, and go hungry for lunch or supper! See you there!! Diaper Drive Completed in March- Over 1000 individual diapers were collected. They will be divided between PC Food Pantry and DNA. Thank you for your generosity. Blanket Drive Completed in February- The church donated 75 blankets to Church World Services during the February drive. Thank you to everyone. Many people, the homeless, those faced with disasters or fires, will receive your gift of warmth and compassion.